Click to see the current civilian MRE page. Three companies produce MREs for the U.S. military – Sopakco, Wornick, and Ameriqual. Since the government doesn’t allow these companies to sell MREs to the general public, two of these companies (Sopakco, Wornick) have produced a civilian version of the MRE. 1. Civilian MREs have around 800-900 calories per meal. Military MREs have 1300 calories per meal. 2. Civilian MREs do not contain the Flameless Ration Heaters (FRHs) in the bag. However, most places that sell civilian MREs also sell the FRHs. 3. Civilian MREs have a more limited menu. Whereas current military MREs have 24 menus – 12 different meals per case – civilian MREs typically only have six different menus per box – two of each menu. The menus included in each case will vary based on production runs but they are usually comparable to the military MREs. 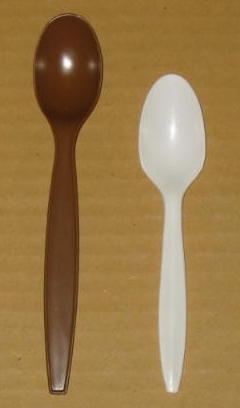 There are also a number of minor differences – no tobasco sauce, no hard candy, different spoon (regular picnic spoon as opposed to the nice, long brown military spoon), no toilet paper, etc. Also, whereas the military MRE components vary from menu to menu (one has peanut butter, another cheese spread – one has pound cake, another has a fudge brownie) – the civilian MREs usually all have the same thing – each has peanut butter and each has a chocolate covered cookie. Or each would have strawberry jelly and oatmeal cookies. Military MREs have wide variety of different components and civilian MREs usually have a much more limited variety. Sopakco produces two different types of MREs – the Sure-Pak 12 and the M-Packed II brands. Wornick produces only one type – the Mil-Spec brand. Sopakco Sure-Pak 12 – this is the one civilian MRE that is most comparable to the military MRE. All food components are exactly the same as those in the military MREs. Each Sure-Pak 12 meal containts: 12 main entrees, 12 side dishes, 12 desserts, 12 crackers, 12 spreads, 12 beverage poweders, and 12 coffees. Wornick Mil-Spec – this MRE is close to Sopakco’s M-Packed II – not near as much food as in a military MRE and not as much as in a Sure-Pak 12 – 12 mains, 4 sides, 12 dessert packs, 12 crackers, 12 spreads, 12 beverage powders, no coffee. Additionally, Wornick MRE entrees are packaged differently. While Sopakco uses the standard tan MRE entree box that you find in military MREs, Wornick uses a white box for its civilian MRE entrees.